Boardmasters, a festival that's always tickled my fancy over the years! When Visa invited me along with them this year, I was beyond excited. This year Visa sponsored the festival, alongside its partner Square, in the hope of changing the way festivals take payments at food vendors & bars. We're all so used to bringing cash with us to festivals, it makes zero sense seeing as there's such incredible ways to pay cash free now! With so many different contactless payment options, it's crazy to think we're still withdrawing cash to take with us each year. Wouldn't it be so much easier to just pay with the likes of your contactless card, phone, or wrist band? (I'll explain about the wristband a little later). 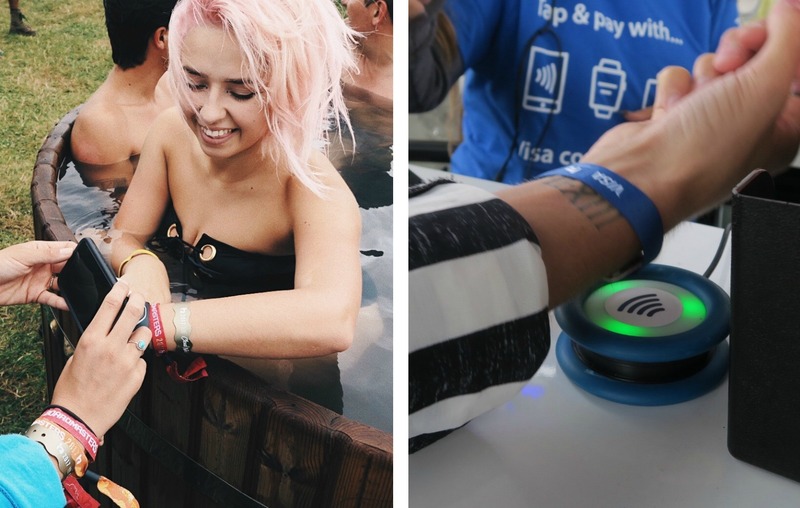 Visa & Square managed to get a majority of the food vendors & bars on board with this quick & easy payment method this year, leaving us worry free as we strolled around the festival with just our cards & wristband attached! "So, what is this wristband you speak of?" Just when you thought contactless payments couldn't get any easier, the bPay wristband by Barclays allows you to pay for anything up to £30, by a simple tap of the wrist. Connecting your card is simple, and this can all be managed by the bPay app on your phone. Anyways, back to the festival! The itinerary looked absolutely incredible, I couldn't wait to get down to Newquay to embark on this new adventure with Visa. The festival is held on the cliff tops overlooking some gorgeous surfer beaches in Newquay, with the best views from the festival overlooking the sunset each night. I think this location has to be one of my favourite for festivals in the UK! We stayed in luxury glamping bell tents, which were each fully equipped with a real bed, & even a faux fur rug and fairy lights! Visa had an incredible butler breakfast in bed service each morning, which allowed us to order breakfast straight from our beds, & pay by our contactless wristbands! The glamping life sure did live up to its expectations with this feature. Over the few days we had at Boardmasters we took part in some incredible activities, such as flying a private plane over the festival site and beaches (it was insane!) & chilling out in wood fired jacuzzis at the eco spa. We also had access each day to Visa’s viewing platform 'The Deck' which was situated directly in front of the main stage, allowing us to have an incredible view for each act! Visa also teamed up with Surfers Against Sewage, the festival’s charity partner to help reduce the number of plastic water bottles thrown away on site. For £2, festival goers could buy a reusable water bottle from the contactless vending machines at Visa and SAS’s water stand. All the proceeds went straight to SAS. I think that this was a great charity to be partnered with for the festival, hopefully more festivals will want to achieve going greener next year. A huge thank you to Visa for a fantastic weekend at Boardmasters! I absolutely loved learning more about the company & its partners, as well as enjoying the entertainment and activities! I like your post and photos.